This blog is mostly about our cats, not so much about us. MAVEN is our first cat. She was born around 01.04.2006 (approximately, she and her siblings were found when they were a few weeks old). She is very smart and loving. Also, she is the only one of our cats that gets to follow us to our walks in a nearby forest. She follows us without a leash, always close to us, as a well trained dog, some may say. She is the oldest one in the cat group, which raises her status, which is good, since Siamese cats have a whole lot of integrity and strong personalities. She is our nicest and kindest cat. She has a mild temper and likes to spend time with us as much as the Siamese do. Jelena wrote a short story about Maven. LEROY, S*Ädelsiam’s Bad Bad Leroy Brown came to us in March 2007. He is a lilac masked Siamese guy, very social and charming and best friend to our other cats. He takes care of everyone. Maven seemed to be bored and lonely during the days, while we were at work. We did want Siamese cats before it happened that we got to take care of Maven, who was looking for a permanent home, and fell in love with her and would never let her go. So, Leroy came in the picture. He was born 11.12.2006. The first night he came to us, he spent in our bed lying on the top of us and staring at us with his beautifully shaped eyes, like a mini alien of some kind. We will never forget that. We saw how Leroy interacted with cats of his own race and concluded that he needs a Siamese company to be a really happy cat. Maven likes Leroy a lot, but she is more solitary than he is. Maven does not care to sleep cuddled next to Leroy, as he would like it. She did that when he was a kitten, and that was it. Maven seems to think that Leroy is just too social! Well, that is how Siamese are. JOSSAN, S*Me-Na-Yak Call Me Josephine Brown is Leroy’s daughter from the only litter he had before he got castrated. Her mum is a blue siamese lady named Hannah. She and Leroy got four healthy, big and loud kittens. 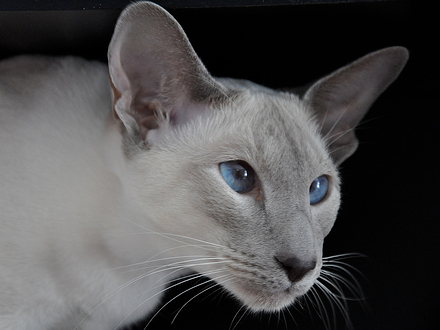 Two kittens are blue, and two lilac point Siamese. Blue is the same as black (brown) pigment color, just diluted, and lilac is diluted chocolate. Jossan was a mini copy of her father as a baby, and turned into a beautiful slender lady that is a one person cat – Jelena’s cat in her case. Other people are not that important at all. Leroy adores her and vice versa. Leroy took a great care of Jossan and practically brought her up. Maven was not happy at first when yet another white, loud kitten came to live with us, but she accepted Jossan and licks her and plays with her the same as with Leroy. MIII, S*Me-Na-Yak Charlie’s Number One Angel came to live with us in spring 2009. She is Jossan’s sister from the same litter, but she lived mostly with her mom and half-brother the first year of her life. She actually found a new home when she was a kitten, but did not like it there, since she was the only cat. She was depressed and spent the most of her time there hiding under the bed. 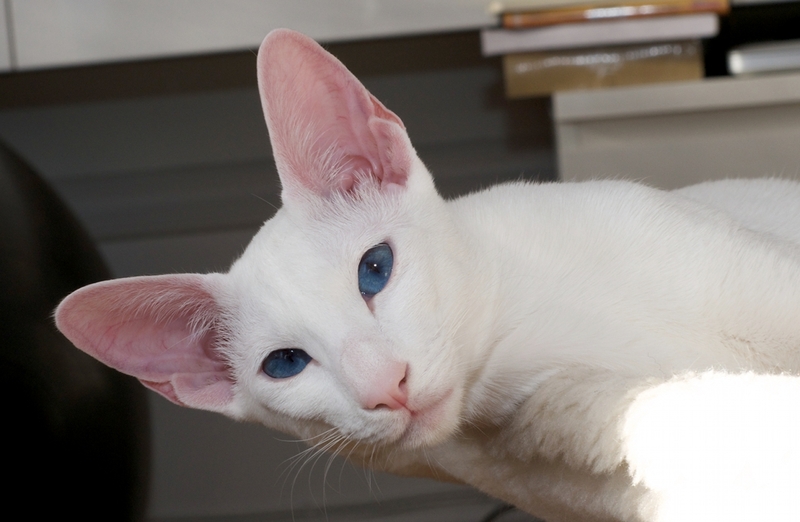 Siamese can rarely be happy as single cats, they need both human and cat company, and I would recommend another Oriental or Siamese cat as a companion. Those cats are pack animals, they are not loners as ‘other’ cats. They behave more as lions than common domestic cats. Miii came to us since we planned to have kittens from Jossan and the part of the plan for socializing her without too much of a trauma was to have her bond with kittens and then find a home for her and one kitten together. Jossan did not get kittens yet (I am writing this a year after Miii came to us), and we fell in love with Miii, so she is staying. Our cat group is a harmonious one. When Miii came, Leroy finally got a wrestling partner, and Jossan and Maven got some relief there, they never enjoyed his daily urges to wrestle. Miii is very intelligent, perhaps she is the smartest of our cats, and she is a perfect Siamese. She is very loving, she purrs, she talks, she does all kind of tricks to have you stay next to her and play with her or pet her and she is very playful. She likes it here and, now, with several cat friends, she is a very happy cat. Jossan’s son Albert from her first litter of seven beautiful kittens. He was the only Foreign White kitten. He was born last and, a few weeks after that, he was the first one that “killed the toy” with a lot of sound effects. Until he was three weeks old we believed he was a girl and called him Miss Piggy, since he was mostly pink in color; his fur was short. Then he became Mr Piggy, but now we call him Bebis or just Albert. All the big cats love Albert and boss him around (or so they keep trying). He has a wonderful temper, loves to fetch his favorite toy (a big white rat) and is usually very happy and content. Still, he is a Siamese, so occasionally he is pretty opinionated and tells us all about his thoughts and demands. Claire is a little clown in our cat group. She is Albert’s little sister from our C-litter that we kept. She has a nice personality, is a lot like her grandfather Leroy, easy going and cool. She is not a one person’s cat, like Jossan or Albert. She plays gladly with everyone when she gets to know them and can be loud if she estimates that may bring her candy. She is crazy about cat candy, especially Dreamies. We hope to have kittens after her, since although not flashy in type, she is pretty and a correct Siamese, and she hopefully will be as good mom like Jossan. But she is mostly our youngest family member, that is what she is. She was exhibited since she was 6 months old and became a Champion in May 2013. SUCH A BEAUTIFUL FAMILY YOU ARE – and we are in close family too. and he is the most adorable and lovely cat I have ever had. 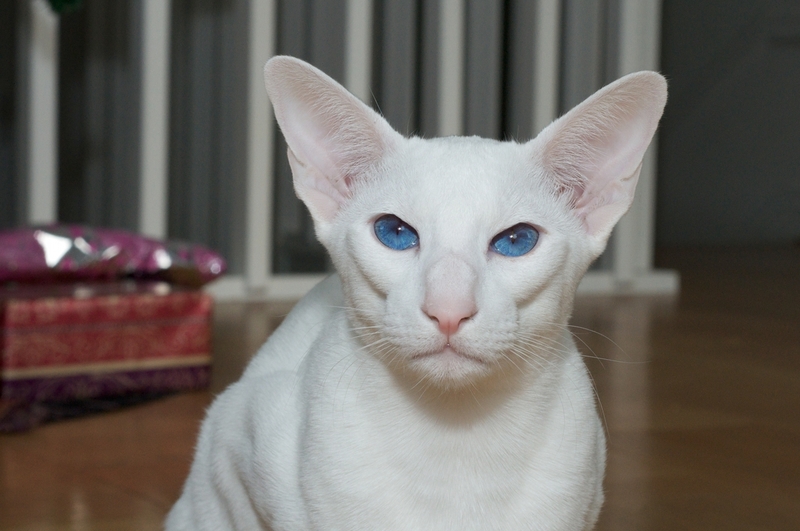 (I have had 5 siamese cats, succesly during the last 48 years). I brought him from Monica when he was 4 months old. Would you please give my best regards to Monica . I have lost contact with her and I am sorry for that. Best wishes for you and the whole cat family from Birgitte Kokfelt . I’ll pass your greetings to Monica! 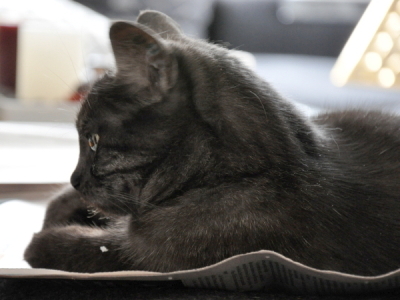 Many hugs and kisses to Gandhi and his humans from us and his cat relatives in Stockholm! What beautifulllllllllllll cats. We have a little man called Trevor he is a fantastic cross seal point, and so human, our first Siamese and what a delight he is, we could not imagine life with out the little fellow, and he’s very loveing, and a little terror at times but well worth it. 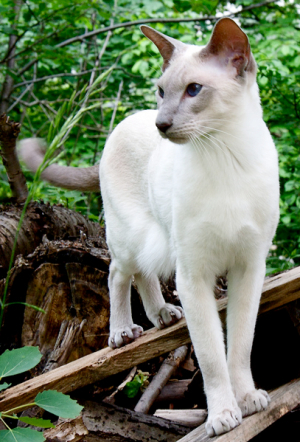 Very beautiful siamese, and such a nice pride. You look like a lovely family. Great photos! Your cat is so charming and cute, I wish you health and happiness forever.